Four European cities are bidding to host the World Congress of Neurology 2021, an international conference focused on advancing the diagnosis and treatment of neurological disorders. 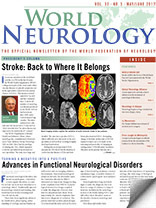 In this issue, World Neurology publishes four articles written by neurology organizations and professionals about why WCN 2021 should take place in Copenhagen, London, Marseille, or Rome. 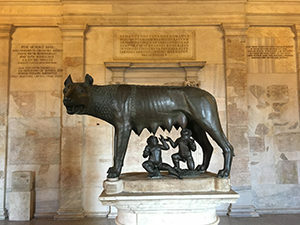 The legendary origins of Rome are seen in this sculpture of the wolf with the founders of Rome — Romulus and Remus. The Italian Society of Neurology (SIN) is bidding to host the 25th World Congress of Neurology in 2021 in Rome. The Society was founded in 1907 with the mission to promote the study of neurology in Italy; foster scientific research, education, and specialist updating; and improve the quality of care delivered to patients with neurological diseases. SIN is an association of public and private neurology specialists, working in community, hospital, and university settings. It represents 3,000 members, making it the largest association of neurologists in Italy, providing a constantly growing number of education and training activities. The Society’s training and updating activities are designed to enhance care activities, promote research studies into nervous system diseases, and facilitate interaction with patient organizations. Much research work is recognized at the highest international levels, contributing to the prestige of the Italian neurological community. SIN develops and promotes a wealth of clinical and scientific initiatives. The vastness of the spheres of clinical neurology has prompted the development of working groups within SIN. Where required, these seek the expertise and contribution of specialists from other disciplines with a view to providing exhaustive responses to population needs. SIN’s official journal, Neurological Sciences, has a 2016 impact factor close to 2 and is among the leading European scientific journals in the field. Italy is a valid representative of the European neurological community. The number of practicing neurologists in Italy is among the highest on the continent and its research activities hold top-ranking positions in international indexes. Its geographic position and cultural vocation place Italy in a pivotal position among nations with a longstanding neurological tradition and North African and Middle Eastern regions keenly committed to the field of neurology. The Italian neurological community has many representative members in international societies in various branches of neurology, besides supporting projects to develop care, research, and scientific updates in all neurological subspecialties. An active and positive member of the WFN, Italy has participated both at the structural level and in the WFN’s various ongoing activities. It should first be stressed that Rome was the venue of the WFN World Congress in 1961, and many Italian clinical neuroscientists have played an active role in WFN activities over at least the last 50 years. Italy offers beautiful cities with modern conference venues, hotels, restaurants, infrastructure, and places of interest. Conference delegates coming to Italy will greatly enjoy the wide variety of suitable venues that provide a high standard of hospitality, with competitive prices compared to other European cities. No less important is that Italy, its history, and its culture attract high numbers of congress delegates. 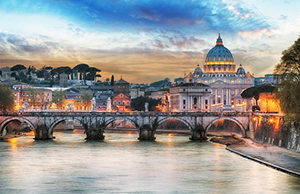 Rome, often referred to as “The Eternal City,” is among the world’s most alluring venues, combining its leading role in the international multicultural scene with its millenary history. Alongside the splendors of ancient Rome and important archaeological remains, such as the Colosseum and the extensive Imperial Fora, visitors are party to some of the best examples of the world’s Renaissance art. Delegates will be able to admire the works of some of the greatest artists whose achievements continue to adorn the city as they have done over the centuries. The Italian capital is the home of important museums (including the Vatican buildings) and interesting permanent exhibitions. A visit to this city will enhance the artistic passion of enthusiasts of every art form (painting, sculpture, music, etc.). Last but not least, being the world capital of Christianity, Catholic delegates from all over the world would have a wonderful opportunity to visit the Vatican.